Day two at Anglesey saw all the same SLC competitors from the previous day tackling rounds 3 and 4, but this time on the longer and faster International circuit. Given that it was early April, conditions were very good, with a dry track, sunshine all day, and only a light breeze. Again, only one practice run was offered, and then the first two timed runs counted for rounds three and four. 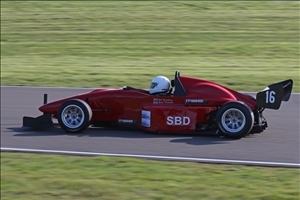 Again 8 single seater racing cars took part, split evenly in pairs across 4 event classes. Peter Goulding was first and Graham Blackwell second in both rounds in the up to 1600cc forced induction class. In the 1600 to 2000cc class, Matt Hillam won round 3 while Steve Broughton was fourth. However, their positions were reversed in round 4 with Steve coming second ahead of Matt in third. Steve Brown and Carole Torkington again scored first and second places in both rounds in the 1100 to 1600cc class, while John Loudon and Mark Anson repeated their respective first and second places in the up to 1100cc class. Alistair Clark was again the only SLC runner in his Elise/Exige subclass, ending up with two fifth places. Justin Andrews (Subaru Impreza) scored two second places in the over 2000cc division. 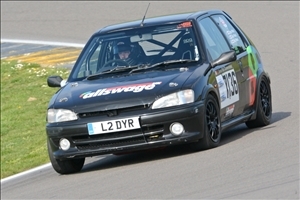 Nick West had a first place in round 3 in the Peugeot 106 GTI , ahead of father Dave West who was second. However, family honour was restored in round 4 when Dave took the class win but Nick slipped to third. Finally Anthony Brown (MX5) placed fifth slot in both rounds in the class for two and four seater sports cars up to 2000cc. Almost all of the competitors who had registered for the Sprint Leaders Championship took part in the first two rounds on the Anglesey National circuit. Conditions were good, with a dry track and some sunny intervals, but there was a cold wind blowing throughout the day. The event format was somewhat controversial in that only one practice run was offered, and then the first two timed runs counted for rounds one and two. Subsequent runs mattered not for championship points. 8 single seater racing cars took part, split evenly in pairs across 4 event classes. Graham Blackwell and Peter Goulding traded first and second places in their Mygales, with a win and second places each in the up to 1600cc forced induction class. In the 1600 to 2000cc class, Matt Hillam came out top in both rounds ahead of series sponsor Steve Broughton in second place on both runs. Steve Brown and Carole Torkington scored first and second places in both rounds in the 1100 to 1600cc class, while John Loudon and Mark Anson did the same respectively in the up to 1100cc class. 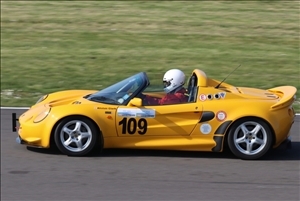 Alistair Clark was the only SLC runner in his Elise/Exige subclass, ending up with two fourth places. Justin Andrews was running his newly reshelled Impreza – now with all the best running gear from his earlier car installed following his Gurston Down mishap last season. He scored a third and a first place in the over 2000cc division. 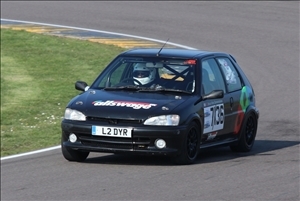 Nick West scored two first places in the family Peugeot 106 GTI in the well supported 1400 to 2000cc class, while Dave West came third in both rounds. Finally Anthony Brown (MX5) took a third and a fifth slot in the class for two and four seater sports cars up to 2000cc.